For a breakdown of the bill’s renewable energy details, see here. Two years, three competing major energy reform bills, more than 300 diverse organizations and companies, and countless hours of negotiations have now come down to one important moment: Illinois’ Future Energy Jobs Act is signed into law today. A clean energy economic development package of monumental size, the Future Energy Jobs Act will create thousands of homegrown jobs, save billions of dollars in wasted energy, and secure Illinois’ place at the forefront of the nation’s clean energy economy. 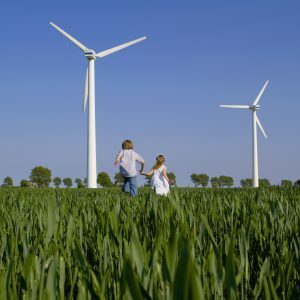 In fact, Environmental Defense Fund’s (EDF) analysis estimates Illinois will see an additional $12 billion to $15 billion in new private investment as a result of the new clean energy priorities in this bill. That’s the greatest economic development package in Illinois in years, and likely will be the largest for the foreseeable future. It’s also the most significant climate bill in Illinois history. We estimate it will reduce harmful carbon dioxide emissions by more than 33 million metric tons annually in 2030. Combined with the ongoing impact of market changes on the fossil fuel industry, this means Illinois will reduce its carbon emissions from the power sector by more than 50 percent from 2012 levels by 2030. Oh, and did I mention customers’ bills will go down? Based on extensive analysis from the Illinois Commerce Commission and Illinois’ consumer watchdog Citizens Utility Board, the Future Energy Jobs Bill’s energy efficiency initiatives will lower customers’ electric bills. At a time when President-elect Trump is threatening to roll back federal environmental protections, state victories like the Future Energy Jobs Act are more critical than ever. That’s the ultimate win, win, win. At a time when President-elect Trump is threatening to roll back federal environmental protections, state victories like the Future Energy Jobs Bill are more critical than ever. And, with strong bipartisan support in the Illinois General Assembly and being signed into law by a Republican governor, the deal is a clear signal that Illinois is ready to reap clean energy’s economic rewards – even if federal leaders refuse to join us in this endeavor. So far, much attention has been placed on the bill’s zero-emission credits, which reward two at-risk nuclear plants for being carbon-free. Yet that piece only represents a small fraction of the more-than-500-page bill, which encapsulates a series of long, hard-fought victories. Energy efficiency: Building on the success of Illinois’ existing energy efficiency programs – which led to more than 85,000 jobs across the state – Illinois will now be home to one of the most ambitious energy efficiency programs in the U.S. Specifically, it requires the state’s largest utilities, ComEd and Ameren, to significantly reduce their energy use by 2030, with a focus on deeper, longer-lasting savings rather than one-off projects. And, according to an analysis by consumer watchdog Citizens Utility Board, these initiatives will help Illinoisans save nearly $15 on their electricity bills each year throughout the lifetime of the deal. Renewable energy standards: For the past five years, Illinois’ Renewable Portfolio Standard (RPS) – which sets a minimum percentage of power coming from renewables – has not resulted in new renewable energy being built. The policy suffered from structural flaws, and renewable energy development in the state had flat-lined. The Future Energy Jobs Bill addresses the policy’s structural deficiencies and improves Illinois’ RPS, directly leading to the development of – at a minimum – 3,000 MW of solar and 1,300 MW of wind power, or enough to power almost 1 million homes. Low-income initiatives: The deal requires $25 million per year to help low-income homes become more energy-efficient, saving money and energy. It also creates a comprehensive low-income solar deployment and job training program, Illinois Solar for All, which could set a national precedent in increasing access to the clean energy economy. Community solar: Speaking of greater access, the bill creates the state’s first community solar program. It will allow those who can’t or don’t want to install solar panels on their roof – like home renters or apartment dwellers – to “subscribe” to a solar project at a local church, school, or business. These clean energy initiatives will drive innovation, create well-paying jobs, and make Illinois more energy independent, while improving the health of both people and the environment. For the past two years, the Illinois Clean Jobs Coalition has been working with the Illinois General Assembly and a wide array of stakeholders, ensuring Illinois would advance energy legislation that created jobs in every part of the state, saved customers money on their electric bills, and combatted the threat of climate change. When environmental organizations join together and work with businesses, members of the faith community, and labor, we can get a lot done. The U.S. is currently experiencing an unprecedented convergence of clean energy innovation and economic growth, and Illinois’ bipartisan leadership is exactly what we need to take advantage of the opportunity. Modern, clean, and local job creation can and should transcend political divides. With Gov. Rauner’s signature, Illinois is sending an important message to the rest of the nation: we can work across the aisle to create policies that grow the economy and help people save money, while protecting the planet. To better understand the core pieces of the Future Energy Jobs Act, we have outlined the historic agreement to fix and improve Illinois’ renewable energy policy. What does it entail, and what does it mean? Learn more here. This entry was posted in Energy Efficiency, Illinois, Jobs, Solar Energy, Wind Energy. Bookmark the permalink. Both comments and trackbacks are currently closed.